A showstopping dessert that will have your guests coming back for more, this pecan slab pie looks elegant and complex, but instead is simple and delectable. 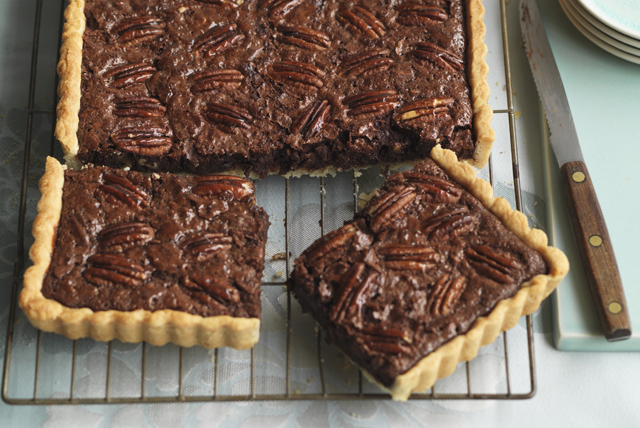 Our foolproof pastry topped with a chocolate-pecan pie filling makes for a dream dessert. Easy as pie! Use pulsing action to process cream cheese, butter and flour in food processor until mixture pulls away from side of container. Shape dough into ball; wrap in plastic wrap. Flatten slightly. Refrigerate 1 hour. Spray 15x10x1-inch rimmed tart pan with removable bottom with cooking spray. (Or, use parchment-lined 15x10x1-inch jelly roll pan.) Unwrap dough; press onto bottom of prepared pan. Place chocolate in large microwaveable bowl. Add corn syrup. Microwave on HIGH 1 min. ; stir until chocolate is completely melted and mixture is well blended. Add sugar, eggs and vanilla; mix well. Stir in nuts. Pour over crust; spread to evenly cover bottom of crust. Bake 15 min. Reduce oven temperature to 350ºF. Bake an additional 15 to 20 min. or until chocolate topping is firm around the edges but still slightly soft in the centre. Cool completely. If you don't have a tart pan, you can use a 15x10x1-inch jelly roll pan instead. Line pan with parchment with ends of parchment extending over sides; spray with cooking spray, then use as directed. Use foil handles to lift cooled dessert from pan before cutting into bars. Not only are the bars easier to cut, but cleanup is also a snap! This pecan pie is best if served after the pie has cooled overnight. This gives the pie a denser gooier texture.